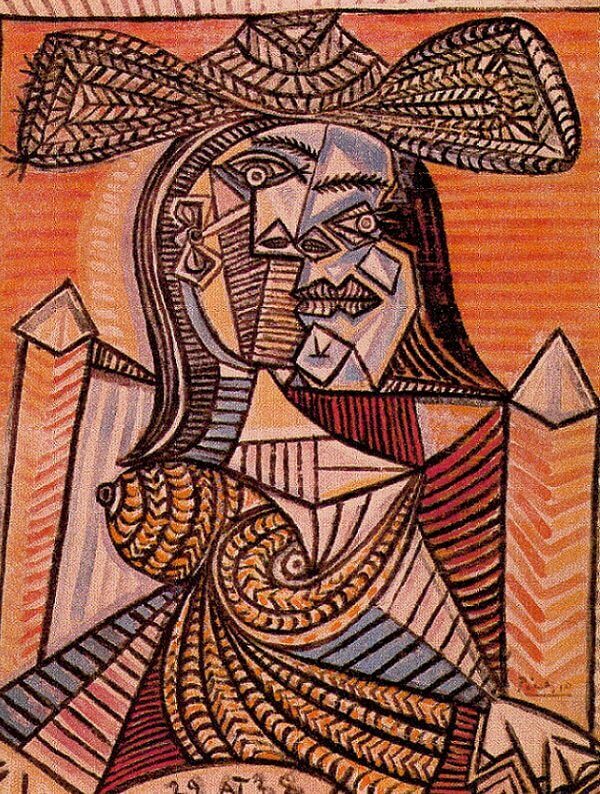 The Seated Woman, 1938 commences the collapse of Picasso's recent explorations of the plastic form into a more rigid phase. Suddenly, the flowing forms are filled with an intricate network of web-like lines that interconnect shapes and colour, creating alternative rhythmic patterns and tensions. Initial workings leading up to this picture show how Picasso played with the human form, using a series of basketwork-style lines to create a skeletal shape. These basketwork constructions developed during 1938 into this involved configuration of colours and lines. Considering Picasso's earlier works this decade, such as Reading (1932), one can see how his work progressed logically in this direction. Again, the viewer sees the skull-like facial development from other recent works, but the recent apple-shaped, fecund breasts now have a life of their own. In fact, the study is simply electric as the energy pours out of the canvas in all directions, though the violence of this energy is possibly moderated by the choice of a pastel palette, which was unusual for Picasso. The work was painted in Mougins, in the south of France, which was Picasso's favourite haunt with his other mistress, Dora Maar, with whom he spent the summer.